which consisted of El Debate, Mabuhay, The Philippines Herald, and Monday Mail. 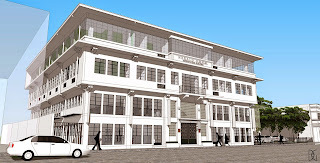 The Herald Building on Muralla Street, between Letran and Lyceum Universities in Intramuros, was built in 1949 as the headquarters of the DMHM group of newspapers; DMHM stands for the four newspapers - El Debate, Mabuhay, Herald, and Monday Mail – that were produced and printed there. It was owned by the industrialist Vicente Madrigal and had an illustrious history that included the first Filipino to win the Pulitzer Prize, Carlos P. Romulo. In time, however, as a result of Martial Law, the newspaper group folded and the building fell into disrepair. Fortunately, one of Madrigal’s grandchildren decided to acquire the property and revitalize it in his honor. The building was restored, with the first two floors for commercial use, including a McDonald’s branch, and the upper two floors for residential or dormitory use. Adaptive Reuse can be beneficial to both investor and the public. Imagine the young people living in this dormitory being reminded of a great history. The spiral stairs in the courtyard, for example, bring to mind images of copyboys running to bring fresh copy to the printing press below. The success of the Herald Building project has led to the development of a new building in the remainder of the property. 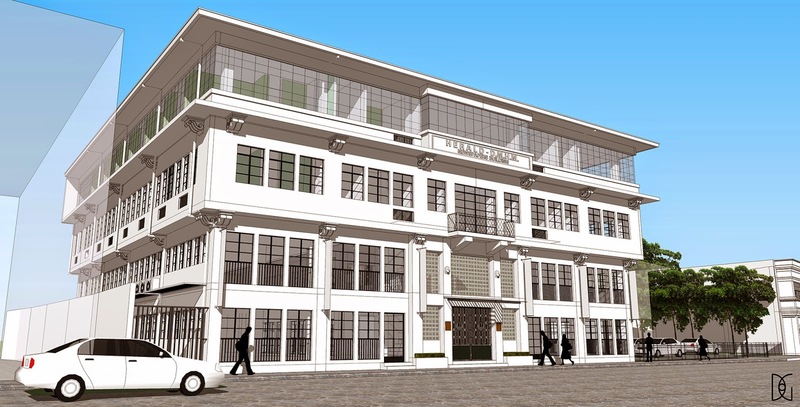 Click on this link to view GMA News TV's Investigative Documentaries segment that features the Adaptive Reuse of The Herald Building. It first aired on Thursday, April 30, 2015.